I have created a new blog where I am describing the activities of our missionary ministry in the UK as they take place. Do please consider visiting the blog on a regular basis, and how you might support our efforts. The fields are already white for the harvest but the labourers are few. I'm so glad that the Coptic Orthodox and British Orthodox are doing this missions work. We need to spread the light of Orthodoxy more in the Western world. I just posted a reply in a thread about a prayer book, and it made me think of a rather odd question. I just have to ask the question, though: Do the British Orthodox ever pray in Old English? I'm not sure why the British Orthodox would ever pray in Old English, but I guess if anyone ever were to use it as a liturgical language, it would be the British Orthodox. It would be great to hear a recording of it, if it were ever used. I have seen videos of the BO conducting a baptismal liturgy in Modern English, so at most Old English would be supplementary (and even this I doubt). You're probably right. No one would understand the Old English (I'm thinking of Beowulf back in high school) so I guess they wouldn't want to use it. It's too bad. It would be kind of fun to hear it. There have been occasional services held in OE by various historical groups I know of. Of course Latin is the language of earlier worship in England. Of course Latin is the language of earlier worship in England. I'm smacking my forehead because I should have realized that. I guess that only makes sense, since England used to be under the jurisdiction of Rome. Wasn't Old English ever used, though, for prayer or other religious purposes, especially before the Norman Invasion? In the back of my mind I seem to recall reading something else in Old English besides Beowulf, and it was Christian, as opposed to the pagan Beowulf. It was a poem, or something, about the Holy Cross. I think the word "Rood" was used for the Cross. Do you know what I am talking about, or am I completely mixed up in my memories? It's been a long time and a lot of my brain cells have died since then. I wish I could remember the poem. In any event, I doubt they'll make a movie of it like they did with Beowulf. Old English was used in a variety of contexts. Caedmon is famous for translating scriptural paraphrase into Old English, and the sermons of St Gregory the Great were translated, and much else. Bede wrote poetry in Old English. etc etc. But the worship of the Church was in Latin, even as the personal spirituality of many people was in their own Old English tongue. I have scanned scholarly papers discussing the issue of language in this context but I can't remember the conclusion. I imagine that some people had a good knowledge of Latin, others had a good enough understanding to follow the liturgy, and others struggled with a few prayers. This is a great blog Father Peter. Thank you for sharing it! salpy, don't give them that idea! i am trying to persuade them to keep it modern, you're undoing all the good work! The poem I was thinking of was "The Dream of the Rood." Is that ever used anymore by anyone? Seafra, that is beautiful cross! I hope our British Orthodox brothers and sisters are OK right now and that none of them have been harmed by the riots. i think everyone's fine, see the 'prayer for london' thread. That's good to know, we pray you're all safe and out of harm's way. We are organising a few things over here in London, God willing. i. A Coptic Language Summer School - this is a 4 day intensive course in Sahidic Coptic being taught by a lecturer in Coptic. I am glad that I have gathered a good sized class, been able to locate a venue at one of the London Universities, and have attracted what I hope will be an interesting mix of students, most of whom are academics. Next year I am planning to run an Armenian Language Summer School, which Father Vahan has promised to teach. These sort of activities are often for my own benefit since I want to attend courses like this, can't easily find them, and decide to organise one myself. ii. A central London mission of the British Orthodox Church, offering Orthodox worship and teaching in English to all who are interested. This will be starting as a liturgy on one Saturday each month. I am presently negotiating for the use of premises in central London. We are hoping and praying that this would develop into a central London community of Orthodox faithful and enquirers worshipping in English. iii. A one day practical study of The Orthodox Way of Prayer - This will be an event held in central London as a mix of Orthodox prayer and teaching about the Orthodox tradition of prayer. I am working to produce a book called The Orthodox Way of Prayer which will also contain teaching and an anthology of Orthodox prayers to be distributed at the event. I am thinking of holding this event before the first liturgy, or certainly the second liturgy, as a means of drawing people who are interested in Orthodox spirtuality towards attending the liturgies. That I pray for you goes without saying. How did the Coptic language courses go? Here is a report. It really could not have gone better.. The Coptic Language Summer School held at King’s College, London over the 5th-8th September was a complete success and even exceeded the expectations of those who participated, and myself who organised it. Over four very intensive days of study a group of eight students progressed with growing understanding and enthusiasm through the first third of Thomas Lambdin’s Introduction to Sahidic Coptic through the inspiring teaching of Dr. Carol Downer, one of the few experts in Coptic teaching in the UK at the present time. The group of participants included a variety of university lecturers from different institutions, several PhD students, and a handful of independent students such as myself. The class turned out to be ideally matched and we progressed through the studies at a very fast pace while also working together so that no-one was left behind. We were fortunate to be able to hold the Summer School at King’s College, London, at the Strand campus, and some of the faculty and students at King’s were participants on the course. The excellent cafeteria facilities on site meant that we did not have to spend time each day looking for somewhere to have lunch together. The room we used was just the right size and had a view out over the Strand. Many of the group were already competent in a variety of other ancient languages, but thanks to the teaching ability of Dr. Carol Downer even those of us whose willingness to learn was greater than our present grasp of Sahidic Coptic were soon able to translate increasingly complex sentences. Working through the exercises, both together in the class, and on our own in the evening, meant that the lessons we were learning took root. By the end of the intensive course we were even able to begin to read passages from the Scripture with some understanding and each participant was able to measure the real progress they had made. Having studied the first third of our text book many of the class asked if a second and even a third such intensive week of studies could be organised in January and at Easter so that a more complete grasp of Sahidic Coptic could be acquired over the course of the year. I absolutely loved the course – the atmosphere was friendly and open, and I felt welcome at once even though I am no language expert. It was just the push I needed to get me interested and motivated to continue pursuing Sahidic Coptic, and the encouragement and support I received has increased my love for the language even further. I enjoyed the course immensely – and hope that the suggested January follow-up actually comes to fruition. I very much enjoyed the course and found it extremely useful. The intensity of four days together was, I think, just about right and the group size and dynamic just enough to spur me on, without intimidation that can sometimes come with language learning. Carol is a wonderful teacher, and there were plenty of course materials provided so, overall, I have no suggestions for improvement. I’d certainly want to take another 4 day course as we discussed. Plans are now underway for a second week of study in early January which will consider the next 10 chapters of our text book. From my own point of view, I am extremely pleased to have reached the end of the Coptic Language Summer School with a genuine grasp of the material we have covered. I shall certainly be reviewing it so that it isn’t lost, and will try to make use of it in the study of simple passages from Scripture. Having picked up Lambdin many times in the past, and put it down again because of difficulties studying on my own, I am very grateful that Dr Carol Downer has led me through these chapters. It's time to update the blog with reports about missions activities during the Olympics. Or at the very least, Fr. Peter can act as our Orthodox correspondent for the Olympic games and tell us how everything is going over there. Have you been to any of the games, Father? father peter's church is quite far from London. anyone trying to travel in london during the olympics is in trouble, as i found out yesterday, attempting to attend liturgy on the other side of the city to where i was staying. 3 1/2 hours in the car and no Holy Communion! so basically those outside london are moving their activities closer to home during the olympics and those in central london are limiting their travel a bit. may God bless those who share the light of the gospel with their neighbours. 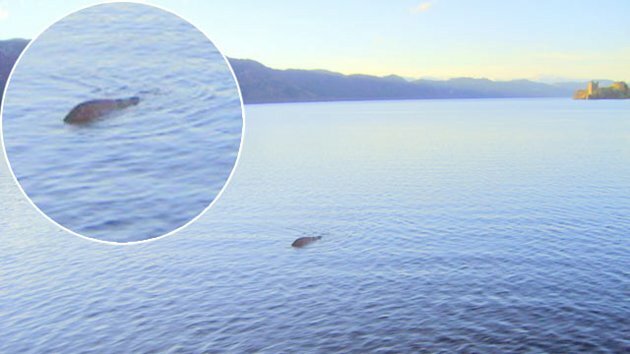 I had no idea that Nessie was first described by an Irish monk in the sixth century. Is the monster something that people really talk about over there, or is it something that mostly just captures the imagination of Americans? Does the Church have a position on it? Could this be the sea monster that the Old Testament mentions? Have any of our British Orthodox members actually seen it, or do any of you know anyone who has seen it? The monster is mentioned in St Adomban's 'Life of St Columba'. There is a Penguin edition and the whole thing is worth a read. Nessie has been poo pooed to such a great extent that interest in her is dwindling. It's a pity but there is still a slight hope that she might be something so far unexplained by science. I've never seen her but when I was up there I noticed a bus load of Italian tourists rush out of their bus and look up and down the loch as if.. We're all hoping! Tonight, Thursday 16th August, there is the monthly mid-week study of the Orthodox London mission at St George in the East, Shadwell, London. One of these days someone from the study will have to start video taping it and putting it on youtube. It sounds like the mission is doing well. Or are the podcasts recordings of those studies? Or are they from other studies? It seems the Orthodox Mission in Great Britain is really doing a lot of things. I wonder how Fr. Peter does it all! this is from a different study day. there are several active british orthodox clergy, but father peter is very busy. this is why he doesn't answer every question on the website. abba seraphim, the metropolitan is also very busy and travels widely through the uk, in turkey, egypt etc. as for the monster, i am sorry to disappoint u but 99% of british people don't believe in it! Yes, it's amazing how much missionary work is being done in Great Britain. It seems every time I look, there is something new. Again, way too bad. 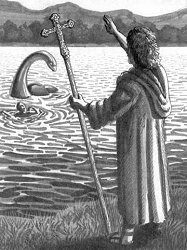 I'd like to think that Nessie is just hiding until another saint as holy as St. Columba comes to the lake and preaches there. If Nessie is there, that would bring him out. But I guess this is just whimsy on my part.